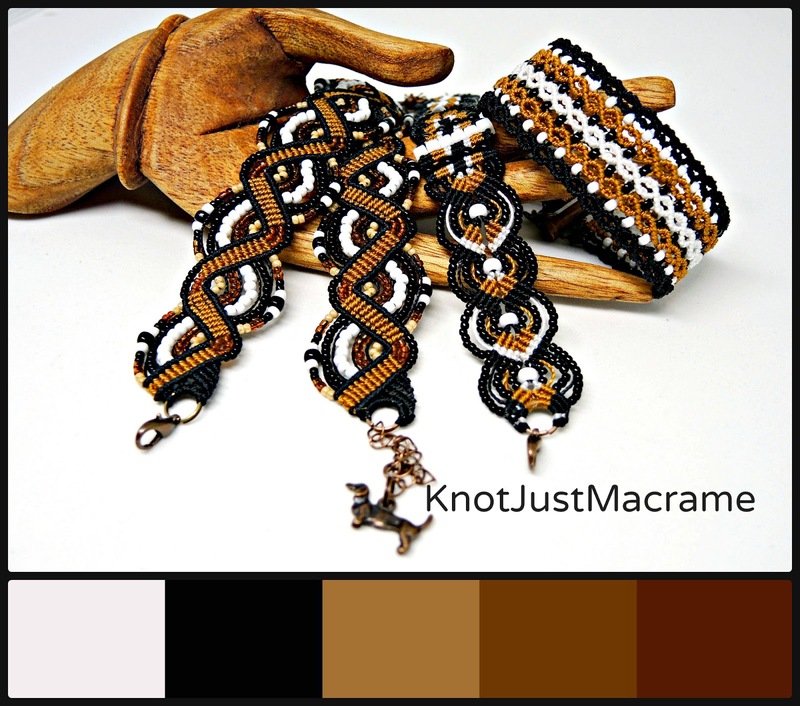 A Brand New Micro Macrame Tutorial AND a Sale! 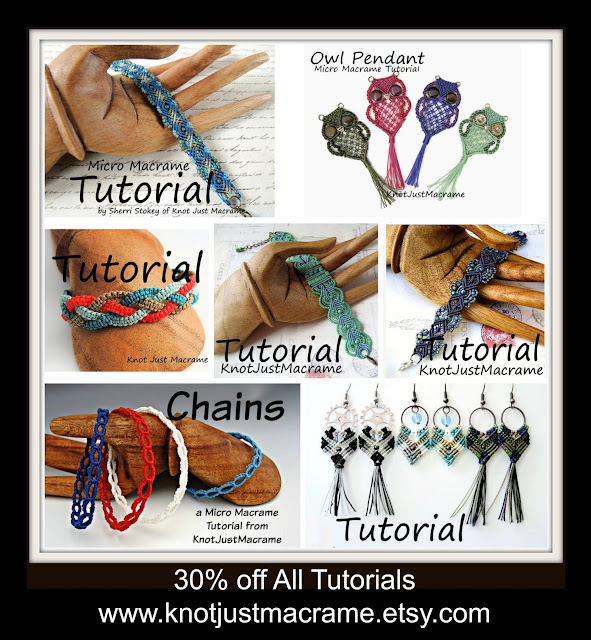 I am so excited to be rolling out a new micro macrame tutorial for you! 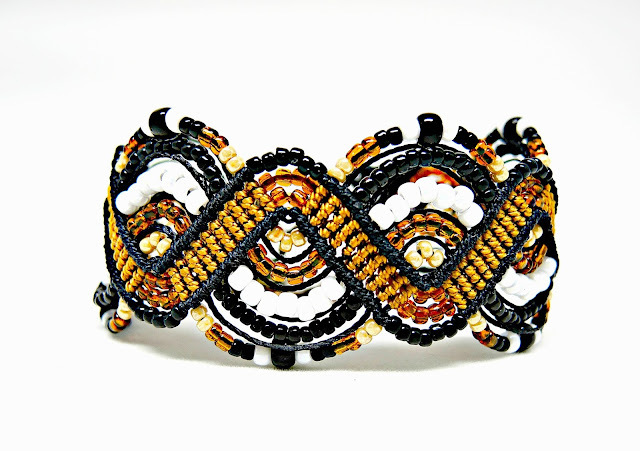 It's a new design that came to me one night as I was laying there un-sleeping (one my least favorite hobbies). It's a grouping of four elliptical shapes (or horse eye or marquis shapes if you prefer) set inside diamonds outlined by parallel lines. If you look carefully, two of the shapes meet to form an infinity link. When I was searching for a name for this one, someone (thanks, Linda!!) suggested the design resembled the intricate patterns found in Gothic windows. Then someone else (thanks, Alison!) pointed out that Gothic tracery is the term for the stonework within the window arch. I think "Gothic Tracery" is a perfectly lovely name for this pattern and so it shall be. 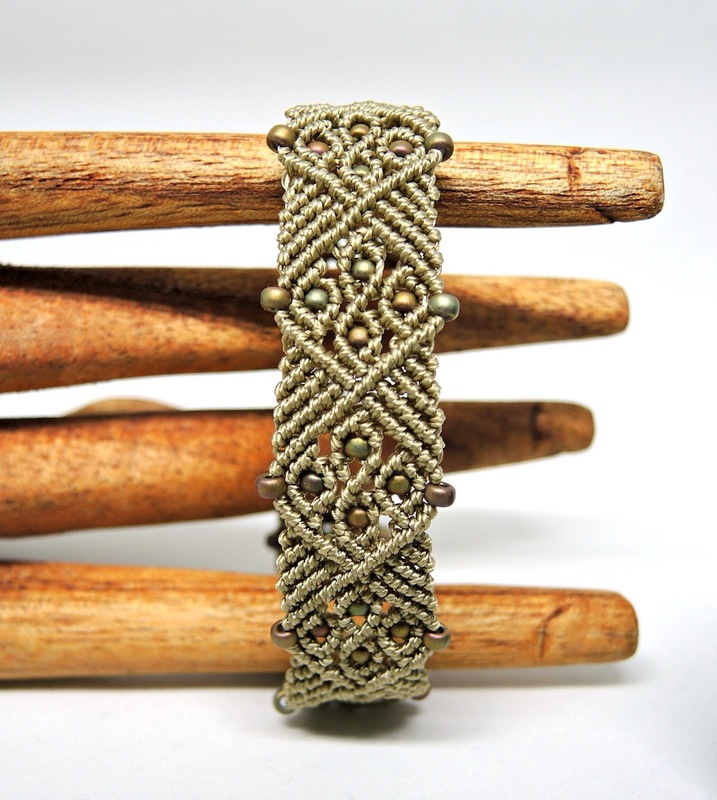 Allow me to introduce my newest micro macrame tutorial: Gothic Tracery! This pattern uses mostly double half hitch knots with just a handful of larks heads. 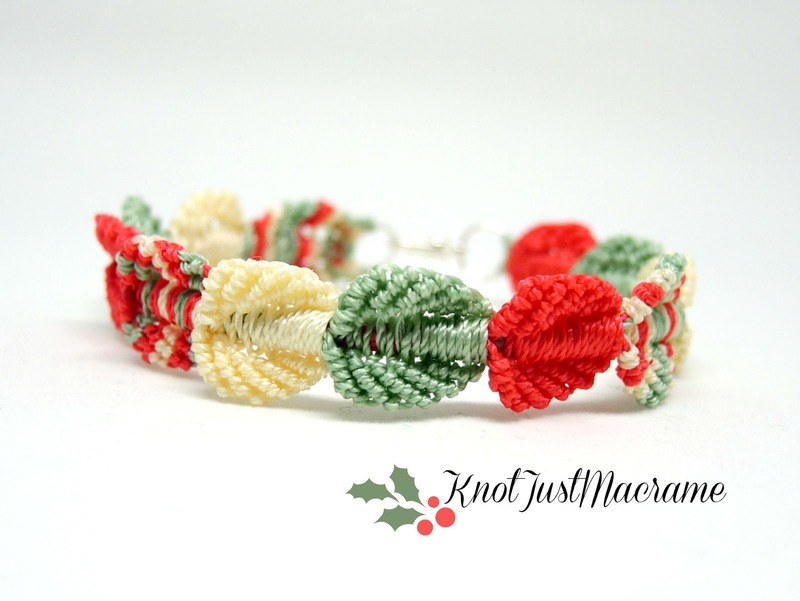 The knots themselves aren't hard, but you have to keep track of which cords you're supposed to be working with as they're heading off in all directions, so I've rated this one as best for intermediate knotters. I wouldn't recommend this for your first micro macrame project but once you've mastered the double half hitch, I'd say "go for it!". To make the news (of a new tutorial, silly!) a little sweeter, this tut and all the others in my Etsy shop are 30% off (no code needed) through 1/1/17. Oh, and if you don't think you're ready for an intermediate project yet, there are plenty of others from which to choose! You'll find them all here. 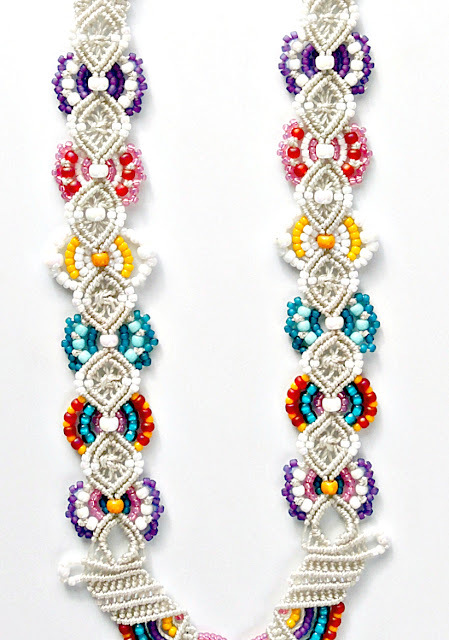 Happy knotting! 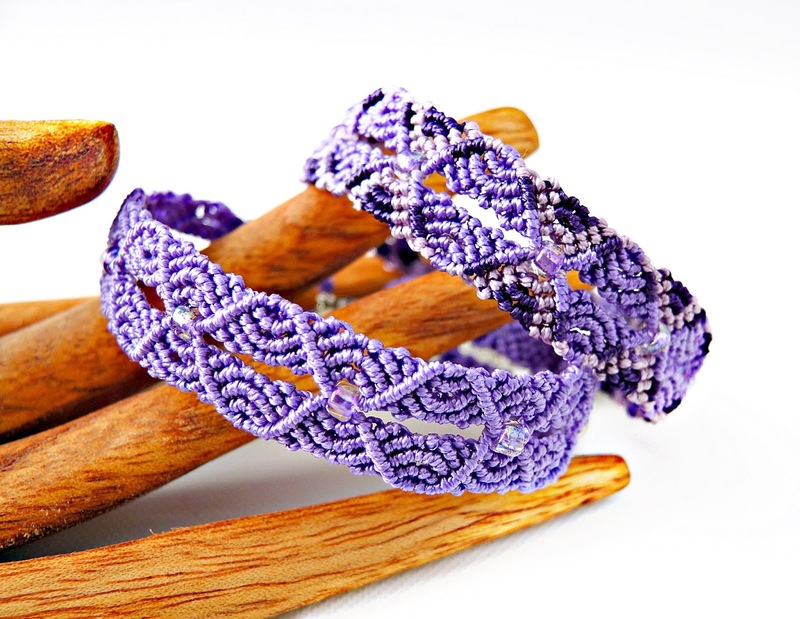 Or a beaded macrame bracelet like these"
Or a macrame owl pendant or earrings! They're all on sale at 30% off through January 1, 2017. 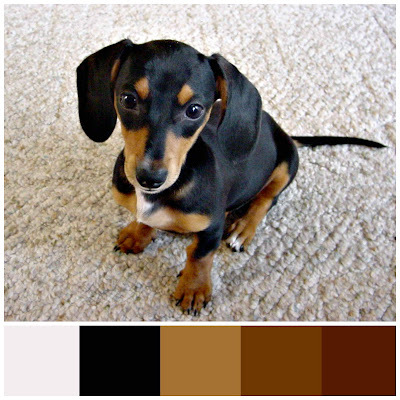 (No code needed.) You'll find them all right here in my Etsy shop. Have fun! 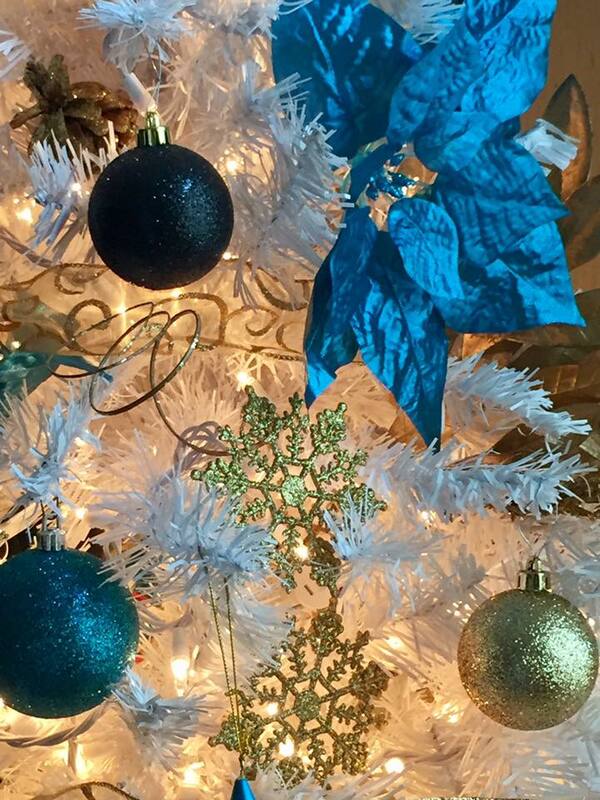 There's nothing cozier than a room lit only by the soft warm glow of the lights on a Christmas tree. Things get so hectic this time of year that I have to remind myself every now and again to relax and enjoy the little things: the smell of spiced apple cider and pine boughs, the crunch of snow underfoot (or better yet, snow outside the window while I'm toasty warm inside! ), or the look of concentration on a child's face while helping make Christmas cookies. 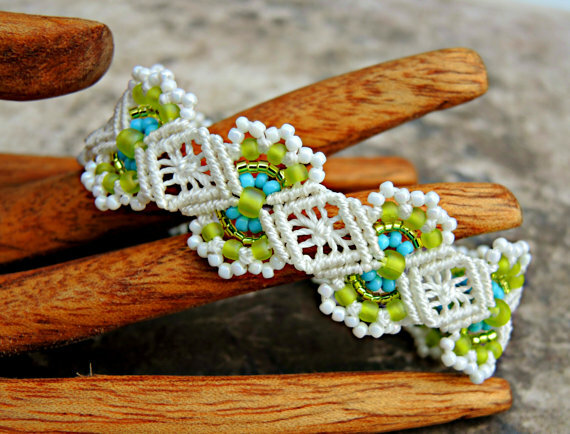 I used a pale green and the softest buttery yellow, then threw in a pop of coral and I'm surprised at the the vintage feel the colors give this macrame bracelet. The pattern is my Falling Leaves Micro Macrame Bracelet and the class is here if you want to try one for yourself. (If you prefer, this piece is available in my Etsy shop here.) It's always fun to see the outcome of whatever new color combination occurs to me and I love the feelings of nostalgia this one evokes. It makes me feel all warm and mushy inside. Brrrrrr! It's been so long since I've posted our weather has changed! We had been having a pretty mild autumn with temperatures still getting into the 70's regularly but today it's windy and cold. I am not impressed. The cold weather does make it feel more like the time of year to be thinking about the holidays, so I guess that's appropriate at least. I may not have been posting, but I haven't been idle. 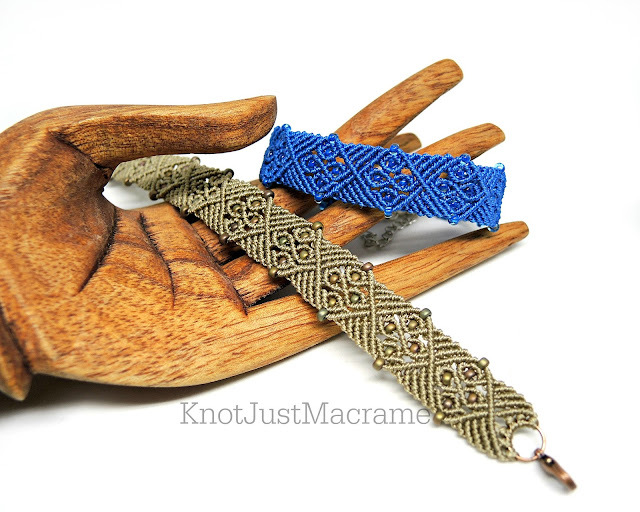 Several new dragon bracelets have hit my Etsy shop including some with a new twin dragon button and a few (like the ecru colored one above) are still available. 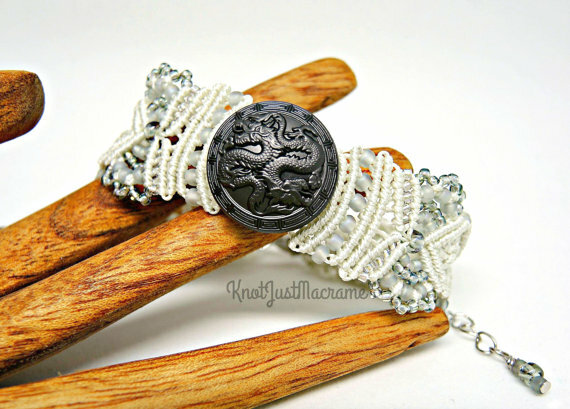 They're unique, original and pretty if you're looking for something special for the dragon lover or Game of Thrones fan in your life. The beads I used are the same in all the versions and they're some of my favorites: neutral with hints of color so they're not boring. 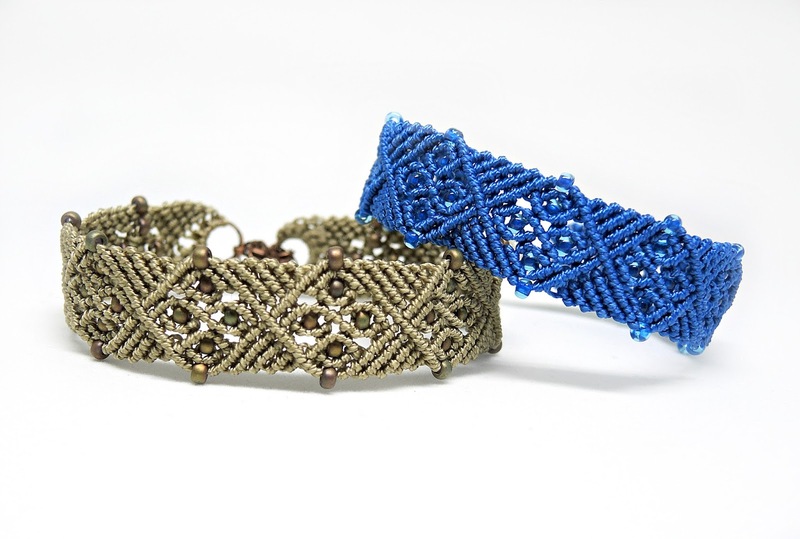 While I had them out, I used them in another micro macrame bracelet pattern, too. It's still strange not having her at my side. I still find myself glancing at the front door to see if she needs in or out and pausing when I put my footrest down so I don't hit her with it. The other day I had to sweep the floor when I finished cooking and that made me cry; we used to laugh that we didn't need a broom as long as we had her around. But I'm also remembering all the good times - her manic laps from one end of the house to the other when she was really excited (we called them zoomers) and her love of grapefruit (go figure!). 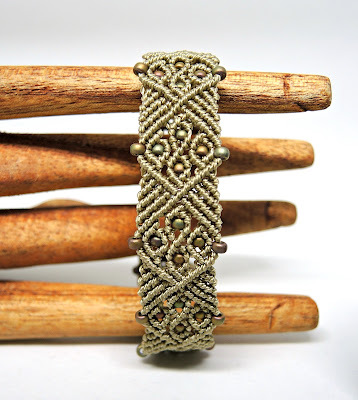 I turned to micro macrame because the movements are comforting for me after so many hours spent knotting (usually with her laying right beside me). 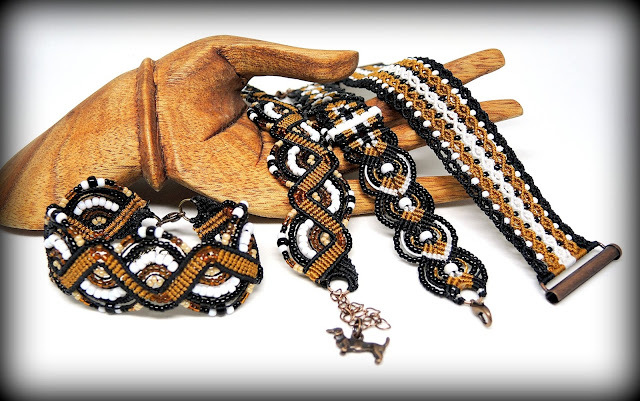 The colors make for really striking bracelets with great contrast between the black and white and golden brown. I don't know about you, but I'm looking forward to better days. Hugs to all. It is never easy to say goodbye to a friend. My little miniature dachschund, Sweetheart, had been at my side for over fourteen years. Technically she was my son's dog, but she had decided long ago that I was her human and anyone who's had a doxie knows there is no changing their minds. Ever. 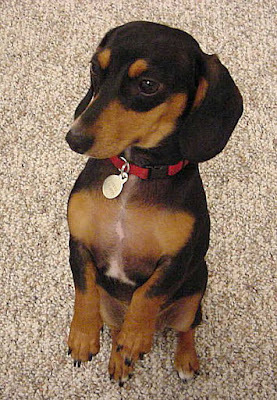 They are very stubborn little critters and unfailingly loyal. 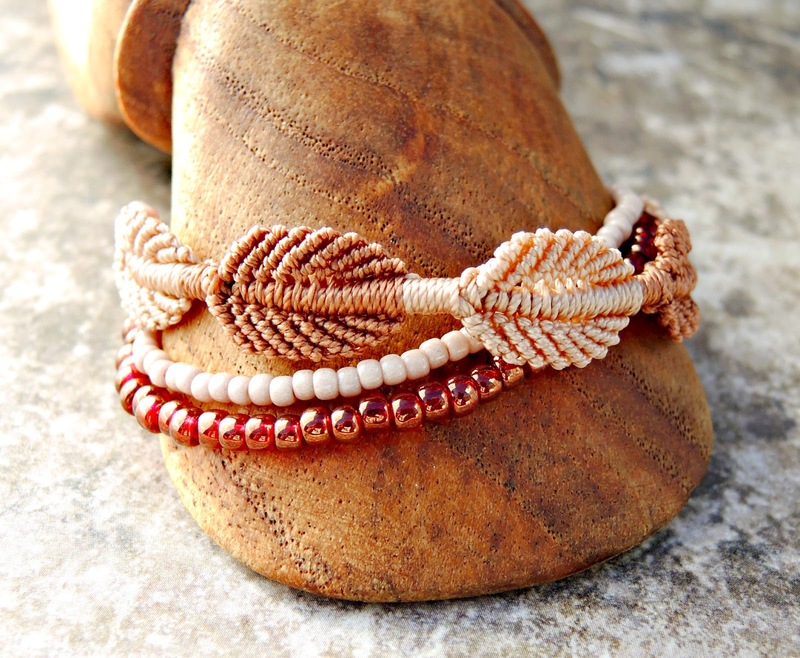 Someone suggested I make a piece of jewelry in her memory and it was incredibly theraputic. I spent a day looking for a photo, which led to looking back through fourteen years worth of happy memories. I found myself smiling more than crying. 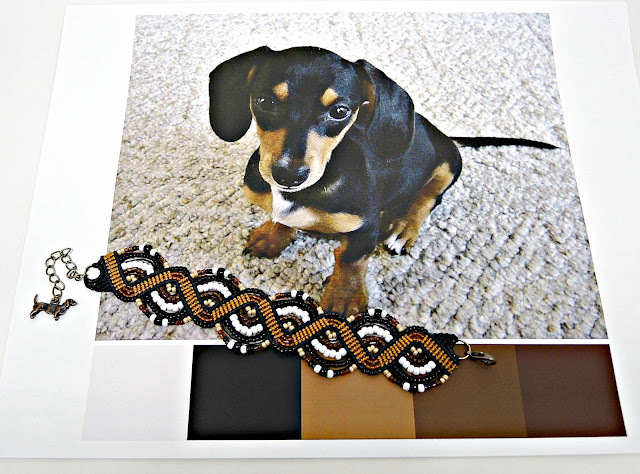 I decided to use a color palette based on Sweetie colors (or Boo as I called her), with black and brown and white cord and beads. 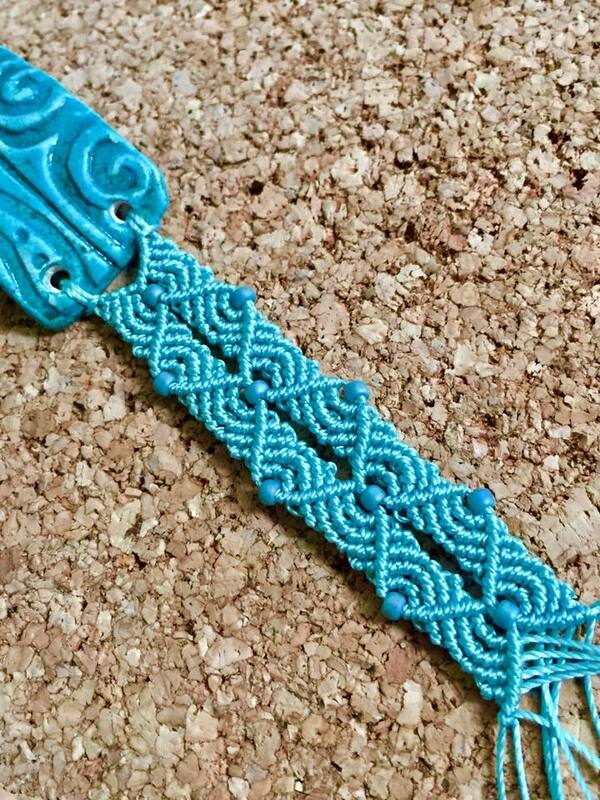 I made micro macrame bracelet and I think it's really beautiful. Goodbye, Boo. You will be forever in my heart. 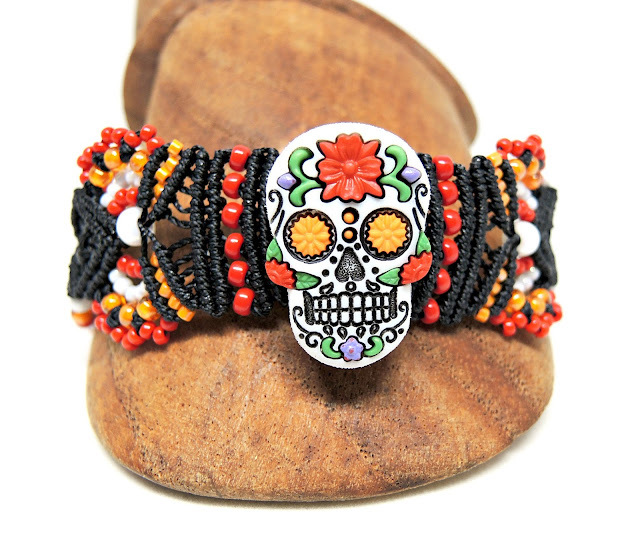 Dia de los Muertos, or Day of the Dead, is a beautiful holiday, a time to honor the dead and remember loved ones. I love the mix of skulls and skeletons with the bright festive colors and flowers. 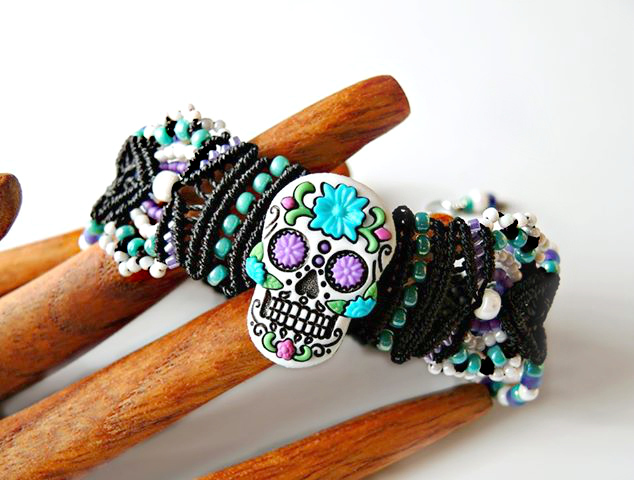 I was so excited to find these sugar skull buttons from Jesse James beads. 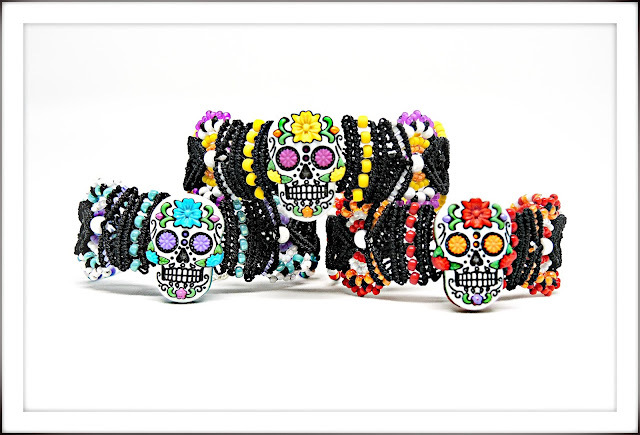 They're colorful and fun and perfect as focal pieces for micro macrame bracelets. I stuck with black cord for all of them but chose the seed bead colors based on the colors in each skull. Aren't they cute? 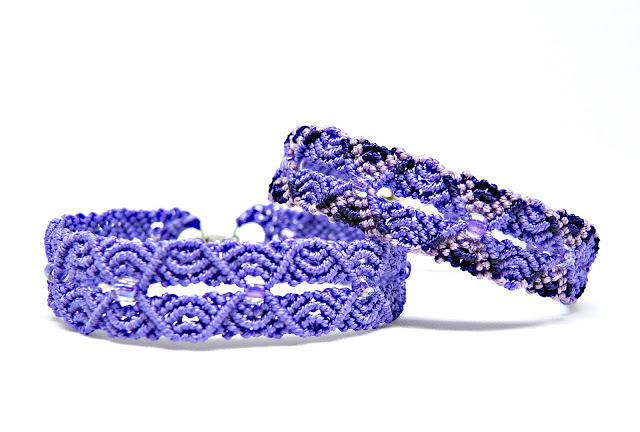 These bracelets can be found in my Etsy shop. 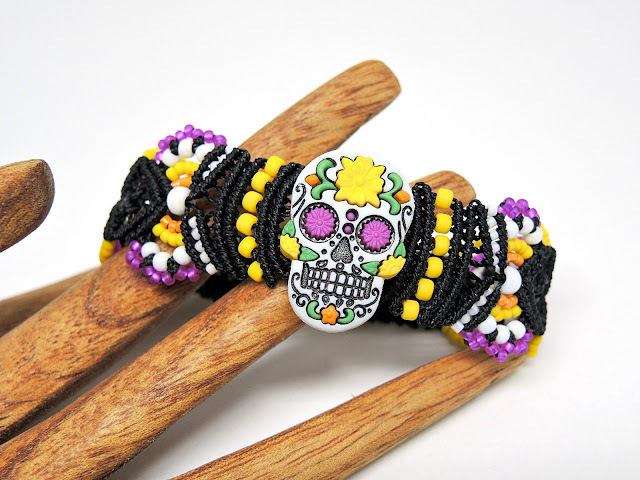 Today is the reveal day for Karen McGovern's Dia De Los Muertos - A Celebration of Life Challenge over at Love My Art Jewelry and I'm so excited!!! I've been dying (hahaha - see what I did there?) 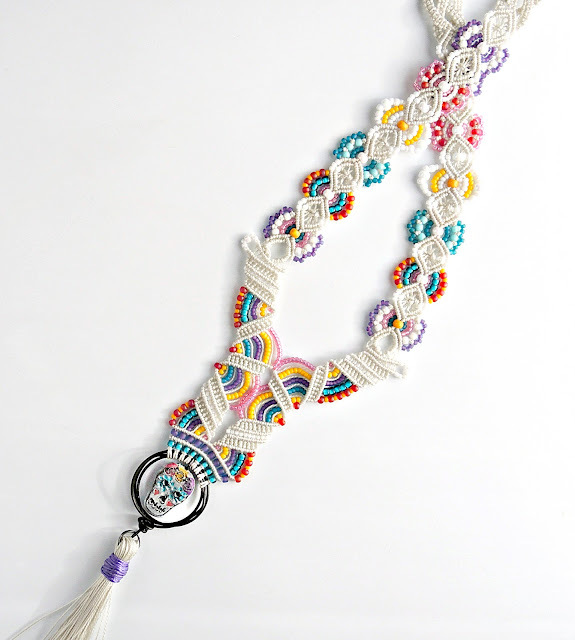 to show you the necklace I've been working on. 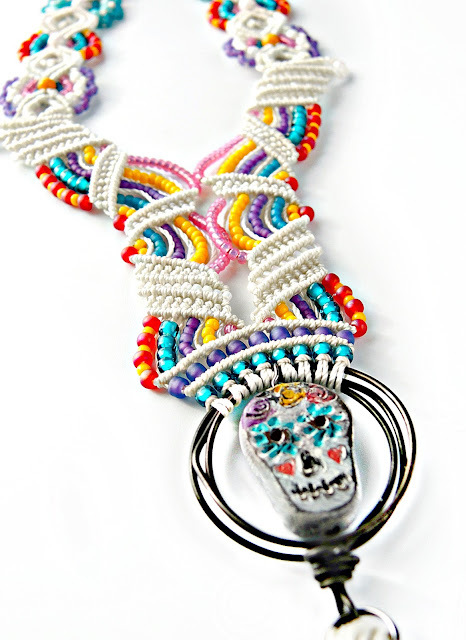 Then I transitioned into some flowers with colorful glass seed beads (because what's a Day of the Dead sugar skull without flowers?). Finally, I added some braided square knot sinnets to make a strap and made a tassel to hang underneath for a little swingy movement. Links to other people's posts will be here - I can't wait to see what everyone made!! New Ripples in Micro Macrame Online Class is Available! How nice is that!? You can see the whole thing here if you aren't already signed up for their newsletter. If you're not, you really should take a moment and sign up so you can stay on top of all the latest and greatest (and sales - who doesn't love a sale!). I keep telling you they're really great people over there and I'm not kidding. They really are the best. If you haven't taken one of their online classes, you don't know what you're missing. 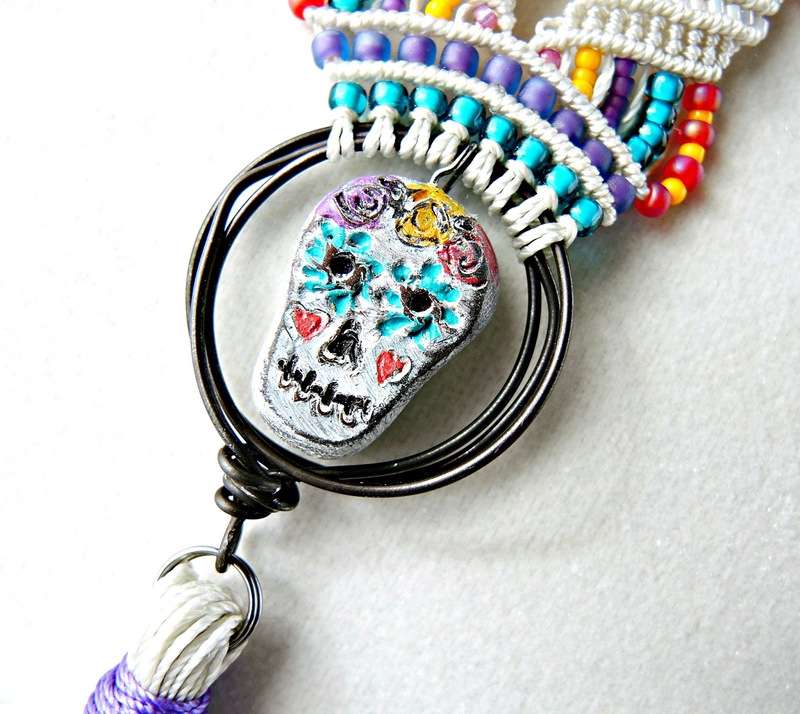 They have an awesome lineup of instructors covering a wide variety of DIY crafts. Their customer service is world class and they guarantee you'll be happy with your class or you get your money back. Classes never expire and there's no limit on the number of times you can view them. Anywho... if you read my blog much, you probably already know I've been working on this new design for weeks now. My inspiration for the design was ripples. Yep. Ripples. So picture a rain drop hitting the surface of a puddle; the way the ripples spread out from the drop in concentric circles getting larger and larger until they bump up against something and break the perfect arcs. Are you picturing it? That's what I've tried to capture in the piece. 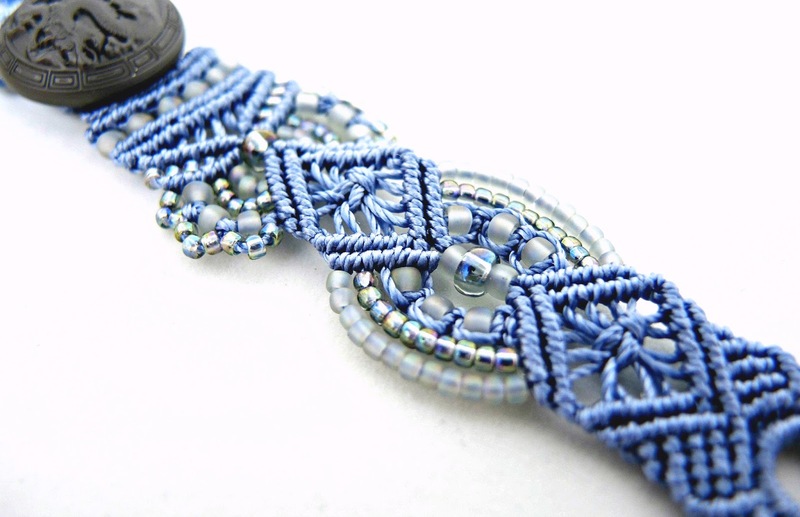 The fluid circles originate at the central bead in one section, then circle back in the next section coming up against one another in the middle. This design takes the simple macrame knots (mostly double half hitches) and elevates them to a new artistic level. 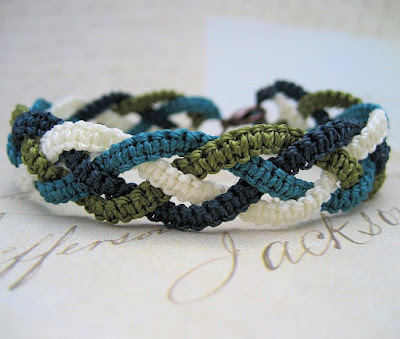 Because the design is a bit more challenging, experience with double half hitch knots is recommended. If you're just starting out in micro macrame, there are other classes (like the Wrap) to choose from, too. Heck, if you're fair-to-middlin', there are a whole bunch of classes for you. Go! Go now and find the one (or more) that makes your heart happy. (The special pricing is good through midnight CT, Tuesday, October 25, 2016.) Happy knotting! 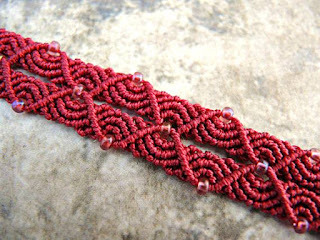 Remember when I was telling you about the frustrations involved in designing a new pattern (back here if you missed the whining)? Well, that's all behind me now! I finally landed on a pattern combination that I really like and I'm working on an online class at CraftArtEdu. YAY! I'd love to hang around and visit for a few minutes, but I'm really working hard on the class. I have the attention span of a 2-year-old, so I have to stick with it while I'm motivated. Stay tuned for more details! 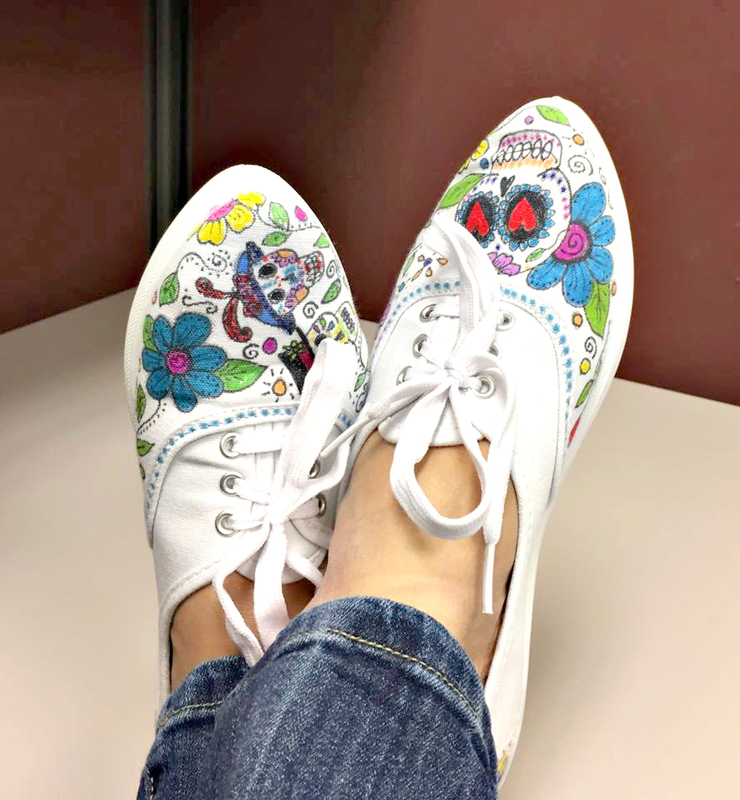 I am so tickled with how my doodle shoes (Day of the Dead themed!) turned out that I just had to share the finished product with you. 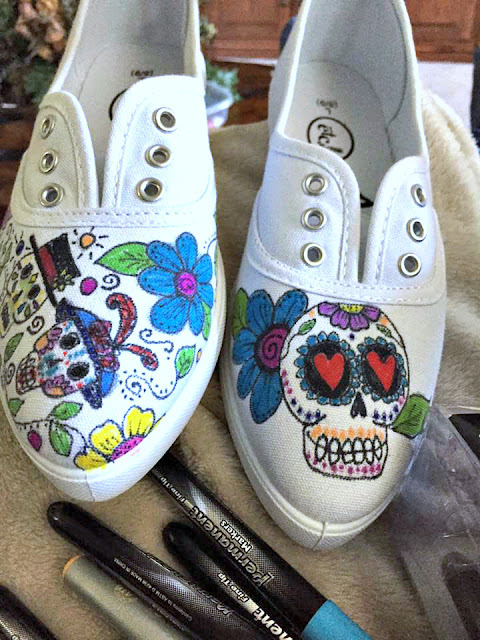 They're just plain white canvas shoes that I drew on (and colored) with permanent marker. Inexpensive (unless you want to buy more expensive shoes, but I was too nervous that I'd ruin them), colorful and fun! 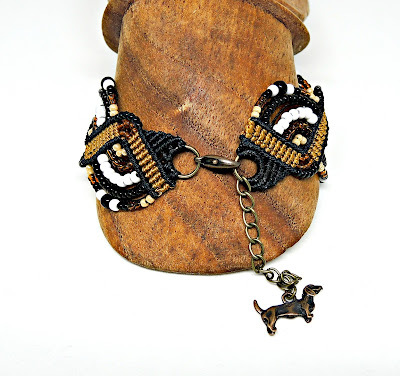 I did a full post over at Love My Art Jewelry if you want to see more pictures. And if you need me, I'll be here admiring my new kicks. Designing Frustrations and Shoe Doodles! And I like that section a LOT! 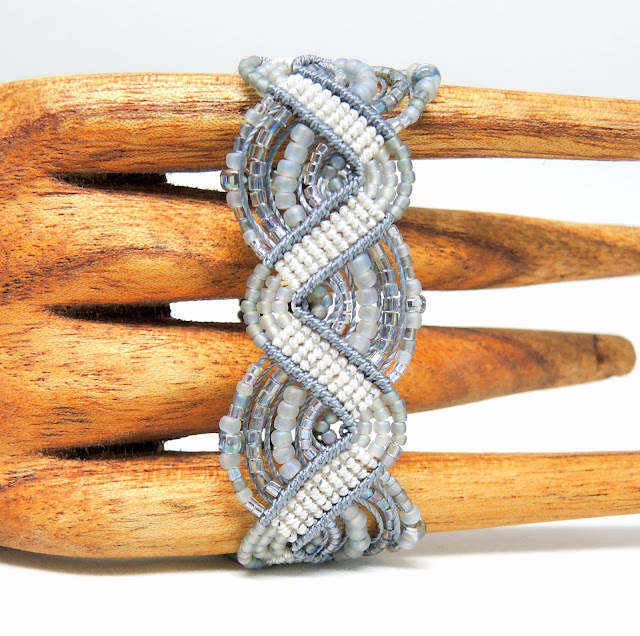 But the diamond part is too similar to other designs I've done and felt lazy, so I started experimenting. 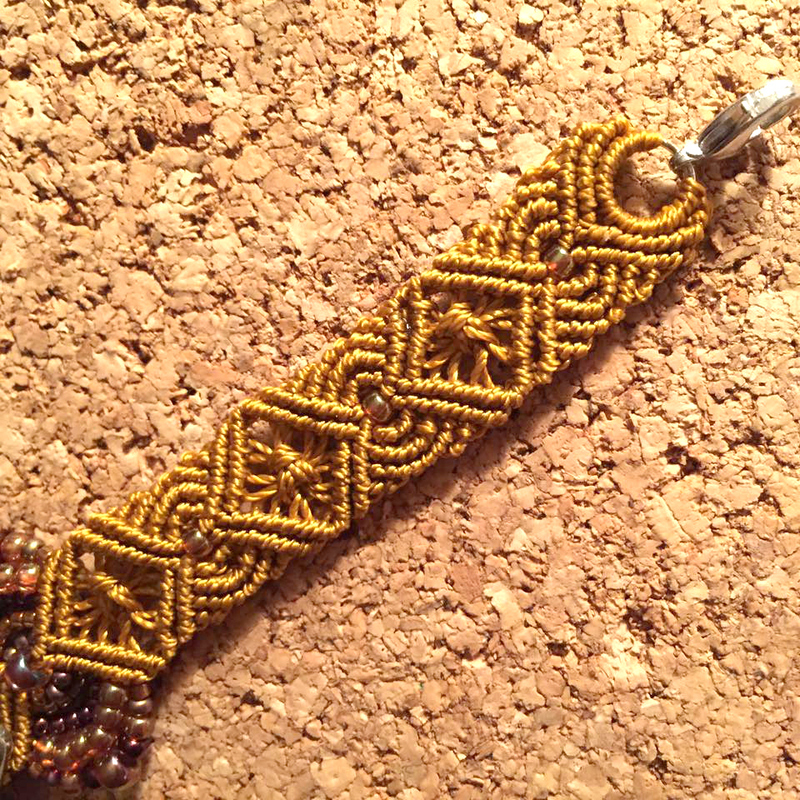 I tried a knotted shape (top of the left piece) but that overwhelmed the new part, so I tried beads (bottom left) which just looked sloppy. I tried reversing it (top right) but that ended up with no structural support. 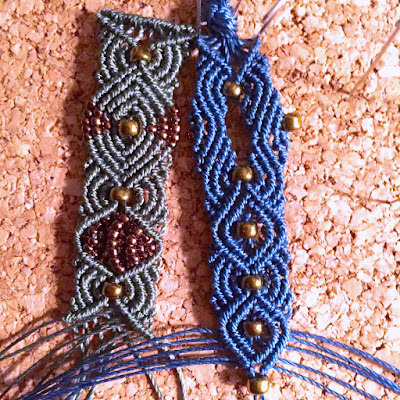 I tried a combination of knotting and beads (bottom right) which wasn't bad, but again felt like it detracted from the ripple design. I like it, but I'm just not convinced it's perfect yet. I think I will try again leaving out the beads along the edges and pulling those "corners" into a more rounded shape. 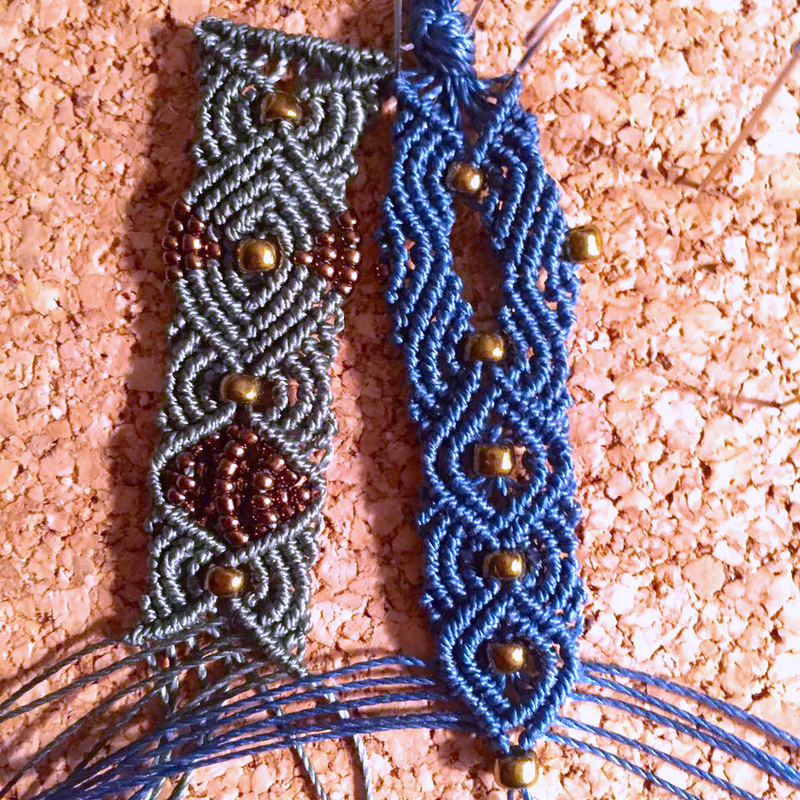 This pattern is using up the cords at wildly different rates, too, so I will need to try to figure out which cords need to be longer at the beginning and which can be shorter. I don't mind the excess cord so much as I just try to use it up in another project, but it seems much more professional for the tutorial if that doesn't happen. This isn't an easy thing, by the way: I either have to try to track each cord through to the end or make another piece using different colors of cord so I can see where they go. And all this happens before I can even start making the design into a tutorial or class, which is a circus all by itself (check out this post if you missed it). PS: this is why it bothers me when folks copy my designs without purchasing them or post them on share sites. It's like they're stealing a little part of my soul, I swear. Shoe doodles! I can only focus on one thing for so long before I start to get bored (and/or frustrated) so this week I've been playing with a new project - drawing and coloring on shoes!! 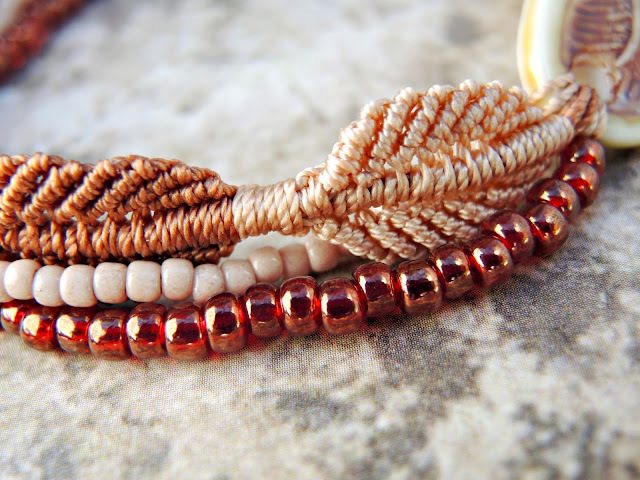 I'll tease you with this in-progress photo, but if you want to see the finished product, you'll have to pop over to the Love My Art Jewelry blog tomorrow! 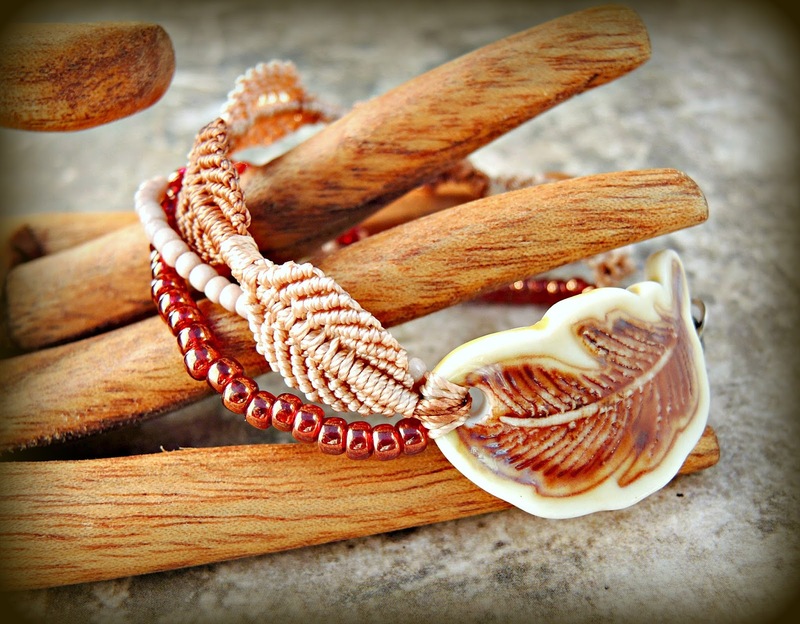 You may have noticed I have a weakness for pretty focal pieces, especially handmade artisan ones. 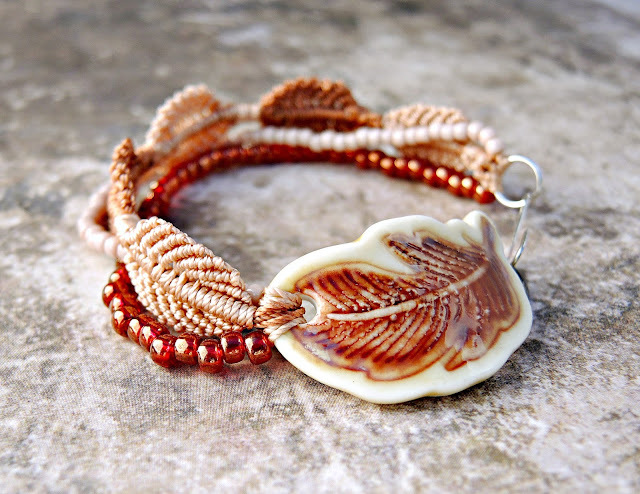 Back at the beginning of the month I was lucky enough to be chosen to receive this pretty handmade porcelain feather bracelet bar from Mari Carmen Rodriguez Martinez of Majoyoal. The gift came with strings attached (no pun intended) and I had to agree to make something with it. Whew, what a tough assignment (read with sarcasm). 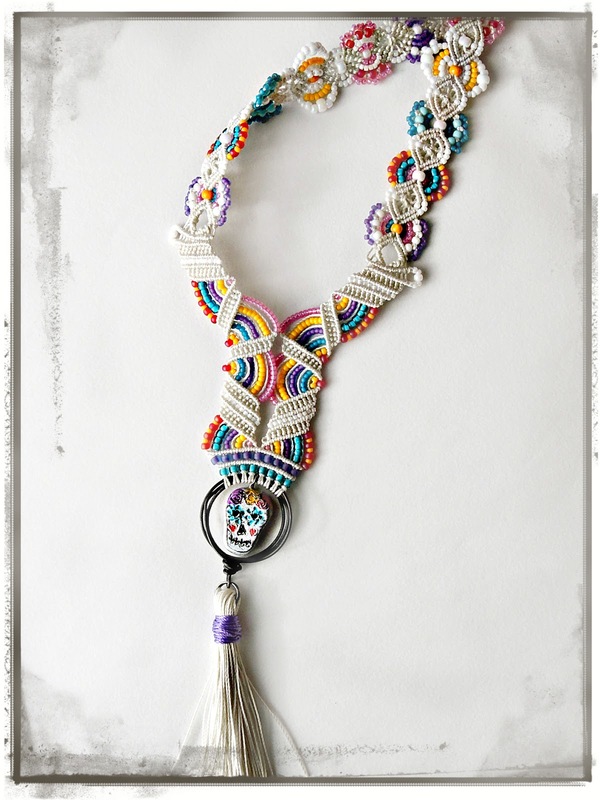 The first thing I did was to attach literal strings to the piece (bwahahaha) because I'm all about the macrame. I wanted to do something to sort of mimic the lines of the feather, so I modified my Falling Leaves pattern, elongating it and adding a "quill". To add a bit more color and some different texture, I added a couple strands of seed beads and made it a multi strand bracelet. I think it's a fun piece and spot on for the autumn season! 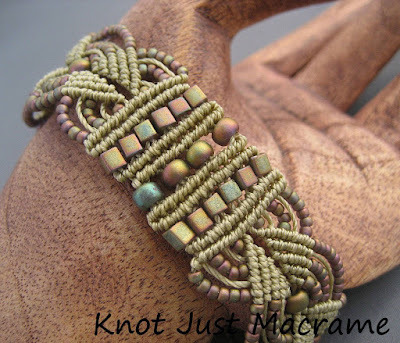 Many thanks to Mari for the gift of her gorgeous focal and to Janice Everett of J-Lynn Jewels who put together a great Facebook group and this component giveaway!